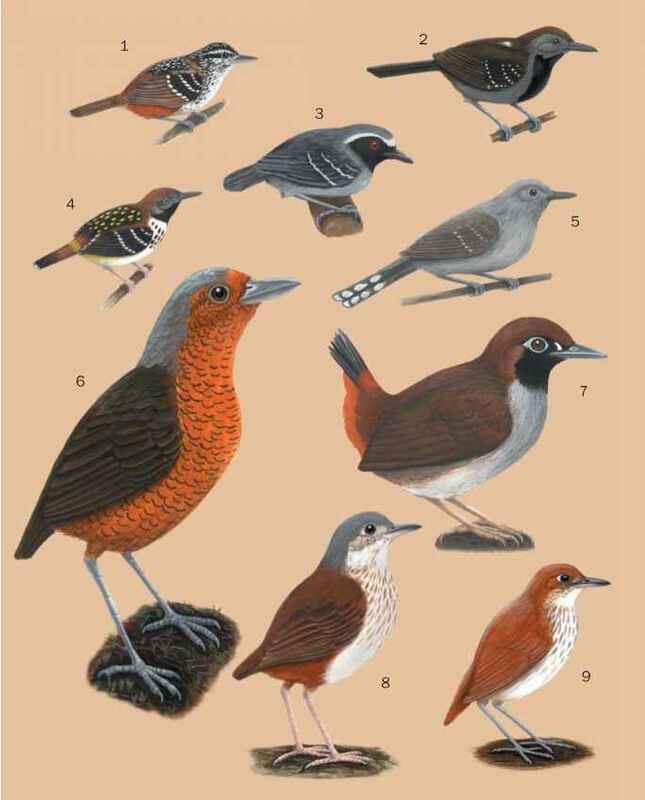 English: Hedge-sparrow, hedge accentor; French: Accenteur mouchet; German: Heckenbrounelle; Spanish: Acentor Común. 6 in (15 cm); 0.7 oz (19 g). The beak is pointed and slender, and the feet and legs are sturdy. Upperparts are brownish gray and usually streaked with black and lighter colors; underparts are more uniformly gray with a few apricot markings. The dunnock occurs in suitable habitat throughout Europe, ranging as far east as the far western regions of Russia. 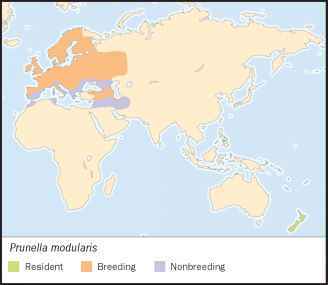 It is migratory in northern parts of its range, but may be resident in more southern parts in France and Spain. The dunnock was introduced to New Zealand between 1860 and 1880, where it persists today. Dunnocks occur in woods with abundant undergrowth, and in hedges and shrubbery near forest edges, typically at a breeding density of less than about 2.6 pairs per m2 (1 pair per km2). In well-vegetated farmland and gardens of midland Britain, however, their density can be up to 30 times greater. tops of conifers of medium height. The song is a short, bright, soft, metallic twittering. During the growing season, dunnocks predominantly feed on invertebrates, including insects, spiders, and worms. During the winter they eat seeds and small berries. They will readily consume food put out for songbirds at winter feeders. Dunnocks build a cup-shaped nest in a shrub or low tree. They breed from about the beginning of April to the end of July, and typically raise two broods per year. The incubation period is 12-14 days, and the young are fully fledged at 11-13 days after hatching. Both parents care for their young. Dunnocks are often polyandrous breeders, that is, a female will mate with several males within her breeding territory, and all may cooperate to raise the young. Not threatened. The dunnock is a widespread and relatively abundant bird. In some parts of their range, however, they have significantly decreased in abundance. In Britain, for example, the species has declined by 45-60% between 1975 and 2001. The most precipitous population decline was during 1975 through 1986, with maintenance of the lower population thereafter. The reasons for the decline are not known, and it did not occur throughout the British Isles (Wales had a population increase).